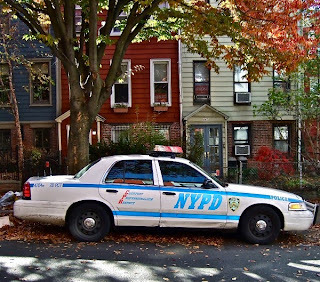 Public Advocate Letitia James has criticized Mayor de Blasio, a fellow liberal Democrat, for maintaining police security – complete with an air-conditioned booth – outside his Park Slope residence which he and his family have left empty since moving into Gracie Mansion in July. The 24-hour security detail – which costs about $5,500 a week, or more than a quarter-million dollars a year – is funded by the city's taxpayers. "I don't understand why [the security detail] is still there, " James said. "Assuming that they no longer live there, it appears to me that it's a waste of money and the post should be removed." James later told reporters, "Obviously, security matters really are best left up to NYPD. And so I'm going to defer to NYPD on all security matters." NYPD officials referred reporters' questions to the mayor's office, which – you guessed it – referred the inquiries back to the NYPD. James said the security at de Blasio's house was worthy of an inquiry, but a spokesperson for James said the public advocate was not planning to launch an investigation against her political bedfellow. Some in de Blasio's circle -- as well as several Park Slope neighbors – say that the mayor and his family do come back home at times, but it wasn't clear how often.